In this sixth-grade humanities lesson, students complete the seed-to-table cycle by preparing sautéed greens and serving them over grains that were grown in the Edible Schoolyard garden. Students learn and practice basic knife skills and safety. Identify a variety of greens by name. Practice basic knife skills while demonstrating proper knife safety and care. Follow a written recipe to prepare a basic dish. Mince or slice ingredients while demonstrating proper knife technique, safety, and care. Distinguish between the "Ingredients" and "Directions" sections of the Sautéed Greens recipe and follow the recipe's written instructions to prepare the greens. Welcome students to the kitchen and introduce the day's lesson. Welcome students to the kitchen. Review the 4B's (Be Safe, Be Responsible, Be Respectful, and Be an Ally). Emphasize that today, as the students' first time cooking in the kitchen, they will have the opportunity to practice these 4B's. 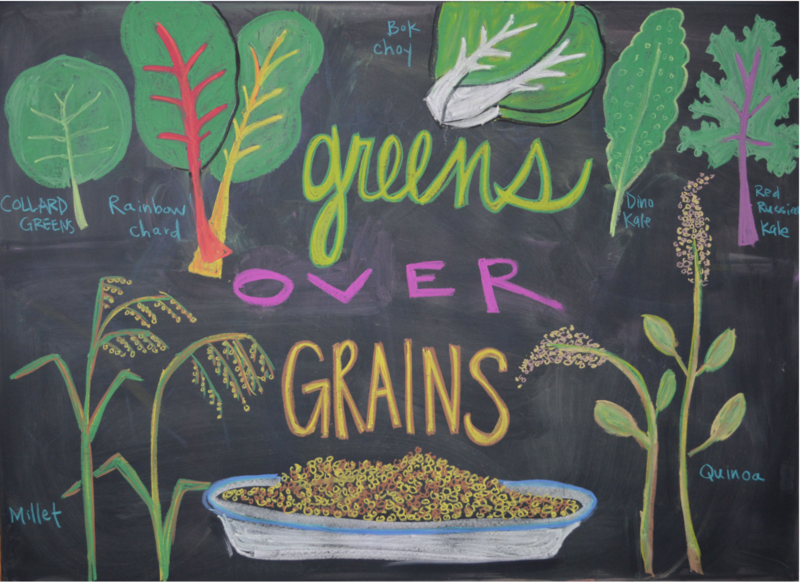 Introduce today's lesson: Greens over Grains. This is a chance for students to prepare food from the garden while learning basic knife skills, safety, and care. Ask students if there are any foods on the board that they recognize growing in the garden. Ask students to identify the greens by name. Emphasize that they may use the visual aid as a resource. Hold up the greens one by one. Ask students to raise their hands quietly when they know what a green is called, and all call out the name on the count of three. For some greens, have students yell as loudly as they can, for others have them whisper, or ask them to identify the greens in happy, tired, confused, or other kinds of emotive voices. Show students a copy of the Sautéed Greens recipe. Explain that they have just identified most of the ingredients they'll be using, and that these recipes will give them all the information they need about what to do with those ingredients. Point out that the top of the recipe has a list of ingredients and amounts, and the bottom has the directions, or what to do with the ingredients. Emphasize that the 4B's will be especially important for the students to successfully prepare the meal because our goal as teachers is to have them work as independently as possible. The recipe and their table-group mates will be their most valuable resources. Demonstrate knife skills and safety before cooking. Demonstrate how to mince the garlic and prepare the greens as part of a knife skills and safety demonstration. Students share their opinion and what they learned. Ask students to rate the meal on a scale of 1 to 5. If there is time, ask students to name one new skill or fact that they learned in the class today. Identifying the greens: We like to vary how we ask for the students to respond when they are identifying the greens by name in the Chef Meeting. Mixing high- and low-volume responses helps to modulate the energy and prepare them to be attentive listeners during the knife skills and safety demonstration. Introducing the greens this way is fun, and generates ownership and excitement around the food. Visual aid: Clearly labeled visual aids that identify the ingredients in this lesson are key in creating access for all of our students. Different students enter the kitchen with varying experiences with cooking and the ingredients we use in this lesson. We want all of our students to be able to participate fully from the beginning, and we never want a student to feel inadequate or unwelcome for not already knowing something that one of their peers does. When we ask students to identify the greens during the Chef Meeting, we explicitly refer to the visual aid as a “resource” and ask students to “do their research” before we ask for them to call out the name. We wait to ask for them to call out the name until all hands are in the air. Asking students to call out as a group instead of calling on individual raised hands is an equity strategy because it provides access for students who reach the answer more slowly than their peers. Recipe reading: We explicitly introduce the format for reading the Sautéed Greens recipe, noting that many recipes will have a similar format—a list of ingredients with their amounts at the top and directions at the bottom. We emphasize that you must read the directions to know what to do with the ingredients. Knife skills and safety demonstration: This is the first time our sixth-grade students work with knives in the kitchen space so we start the lesson with a knife skills and safety demonstration. As part of the demonstration, we recognize that some students might have experience with knives at home, but that the guidelines around knives in this space are different because there are different concerns and constraints with so many people working at once. This helps to draw the attention of students who may otherwise feel that the guidelines are irrelevant to them. For a more detailed description of our knife demonstration, see “Knife Skills and Safety Demonstration” resource. Help and consent: Because this is the first time cooking with these students, we pay special attention to noting the skills and levels of experience with cooking our students are bringing to the table. We moderate group dynamics so that every student feels welcome, accomplished, and a sense of ownership over the space regardless of cooking skills. For experienced students wanting to showcase those skills by helping their less-experienced peers, we often prompt them to ask their peers if they want or need support before they jump in to “helping” them. Team-building and cleaning: As the first time cooking in the space, this is also the time to establish team ownership of tasks including cleaning. Academic connections: This lesson is an excellent opportunity to review the seed-to-table cycle or the Paleolithic domestication of grains (6th Grade California State History-Social Science Content Standard 1.3). In years past, we have included both of these themes in our Chef Meeting. We decided not to this year in order to cut down on the direct instruction that happens at the beginning of class to make sure we have all of the students' fresh attention for the knife safety and skills demonstration, and to give plenty of time to cooking and eating. Double-sided recipes: We like to copy the Millet & Quinoa recipe on the back of the Sautéed Greens recipe so that students can easily take both recipes home. ESY students and teachers approach lessons with intention by thinking through how the recipe relates to the kitchen, garden, and wider environment as a whole. Identify ingredients by name, and discuss them using descriptive words in conversation.